Great on any meat, eggs, fish or chips for authentic New Mexican Flavor. Chill and serve El Pinto Mild Salsa for best flavor. Chill and serve El Pinto Mild Salsa for best flavor. Great on any meat, eggs, fish or chips! 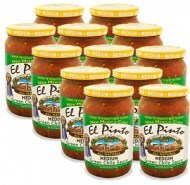 For the Flavor of New Mexico, it's got to be World Famous El Pinto Mild Salsa!